No organization is doing more to green New Orleans than Global Green USA, the American arm of the international environmental organization that was founded by former Soviet leader Mikhail Gorbachev. That begins with the Holy Cross project, an entire sustainable village being built in the city’s flood-damaged Lower Ninth Ward, with the help of Home Depot’s corporate foundation. Eventually the village will include five sustainable homes, along with an 18-unit green apartment building and a community center. Three homes have been completed so far, including one that is serving as a de facto visitor’s center. 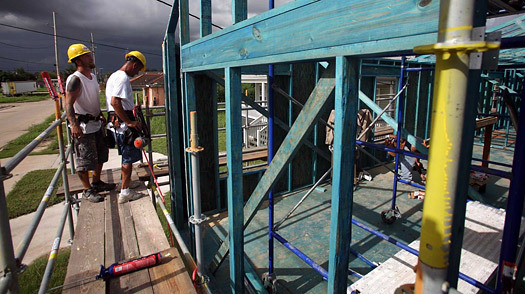 The point of the project is not just to provide greener homes for New Orleans’s returning residents, but also to provide training for the local building community in green standards. “That’s one of the ways to make this kind of building more common and more affordable,” says Petersen. That’s the same motivation behind Global Green’s sustainable schools program, which will both retrofit existing schools to make them more energy efficient, and build entirely new classrooms from the ground up. The new schools will have solar panels, wetland habitats and rainwater cisterns. At Gentilly Terrace Elementary School, which is getting an energy overhaul, power bills should fall some $22,000 a year. In a city that is struggling to get back on its feet, those energy savings make a difference  as does the fact that some research has shown that students actually learn better in greener schools. The truth is, however, none of us will be safe from global warming unless we can change the way we build and the way we use energy  and New Orleans just happens to provide an excellent opportunity to try that in an urban environment that needs to be rebuilt from the ground up. Nor will it be the last major city to be menaced by rising seas  from New York to London to Shanghai, most of our major metropolises are built next to the ocean, and it’s only a matter of time before the next superstorm hits. If we can build back New Orleans in a way that is both sustainable and resilient, capable of surviving another Katrina, we all might be better prepared for the hot and unstable days to come. Is Baghdad Now Safer Than New Orleans?